< Radiographs are more diagnostic when they are digital! 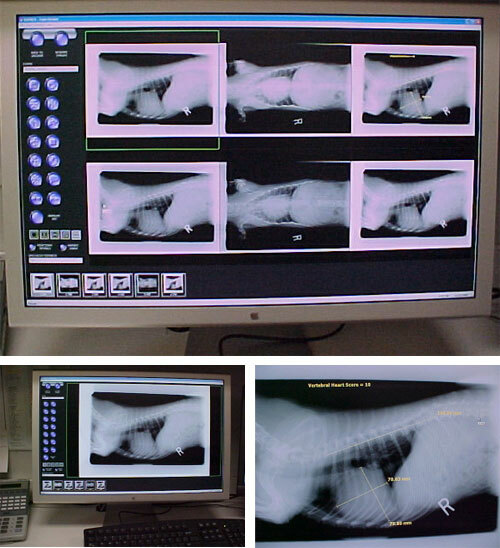 We are very proud that we were the FIRST Animal Hospital in Maryland to have purchased Tru-DR Digital Radiography. Let me explain why we are so excited about this revolutionary technology. We are all familiar with X-Rays (Radiographs). We have all seen the "films" taken of us or of our pets on the fluorescent view boxes hung on the walls. This technology, which is used by 99.99% of the Medical and Veterinary facilities in this country, has lots of potential problems. When a technician "takes" an X-Ray, he or she is actually exposing a piece of radiographic film, within a special holder called a cassette. Inside this cassette is a layer of special chemicals (the screen) that "light up" when hit with radiation and in turn expose the radiographic film. This film is then developed either by hand in tanks of chemicals or, more commonly, by and automatic x-ray processor. OK, so what is wrong with this system? The special chemical layer (the screen) deteriorates with age and produces images that are more and more fuzzy with increasing age. X-Ray film, if not handled perfectly, can have artifacts which can interfere with interpretation. Developing fluids age, and if not kept in fresh condition and used at the right temperature, the resulting image may be fuzzy, or under developed. If the radiographic exposure is too light or too dark, the image may not reveal the information that is needed to make a diagnosis. Digital Radiography fixes all of the above. The image plate is much more sensitive than the radiographic film-screen combination. The number of pixels per inch is far greater. Additionally, the image plate is "read" by computer and can register many more "shades of gray" than can be seen by the human eye. When the technician takes a "picture", the image is seen on the computer within 4-5 seconds (versus 4-5 minutes with traditional radiographs). This allows the technician the flexibility to retake images immediately if they are not perfect. Once the image is put on computer, the doctor can manipulate those images in many ways to extract information. We can greatly magnify the image to see details otherwise invisible to us. We can change the brightness and the contrast of the image, once again, to make details appear that would otherwise be missed. The particular system that we have purchased also has a special enhancement feature that processes the image to bring out hidden details that the computer picks up, but would be missed by the human eye. Seeing is believing, ask us for a demonstration.